I hit my noon run today. 50 degrees in December, I'll take this running weather any time of the year! It felt good to be back. My shin seems fine, but the 5 mile run was hard. Simply put, I'm not used to running. 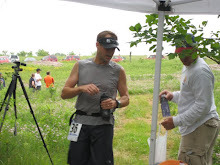 I think just about 3 months ago, I won a 50 mile race. Not any more. Other runners are telling me how quickly I'll come back - we'll just have to wait and see. It is funny how the small things are noticed on the run. I was going over a wooden bridge - and sometime between the last time I ran and now, the city replaced some of the old boards on the bridge. The city has still not fixed the large gaping hole on the bike path - but maybe that is slated for next summer. The 5 mile run was an easy run done in about 38 minutes. A little bit fast, but it didn't feel that fast. After the run - I spent about 15 minutes doing some general strength training along with stretching. This is new to me - instead of running a mile or two longer, I now know the importance of a proper warm-up and cool down in order to keep me healthy and running for a long time. 11/23 - Return to Running!! !